The Cynthia Woods Mitchell Pavilion has consistently ranked in the top six amphitheaters in the world for the last three years based on ticket sales according to Pollstar magazine, the concert industry’s leading trade publication. 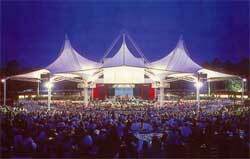 The Center serves as the summer home for the Houston Symphony. It also offers a wide variety of performances including musicals, ballet, rock and other programs. The expansion includes 3,908 new covered seats bringing its covered seating capacity to 6,387 and total capacity to 16,040. The expansion project began in December 2008, after Hurricane Ike winds sent debris shredding the 20-year-old original fabric tensile roof. The structural steel supports and stage house remained intact.